The Army has created a brand new category in this year's Army Photographic Competition aimed at cadet organisations across the UK. The new 'Cadet Life' category is open to all young people in the Army Cadet Force. “Cadet Life is a brilliant opportunity to show life in the Cadets from a cadet’s point of view,” said Command Master Photographer WO1 Will Craig. As well as their own specific 'Cadet Life' category, cadets, along with CFAVs*, are also eligible to enter the Amateur Portrait, Amateur Sport, Amateur Soldiering and Amateur Portfolio categories. The Army has also created a new category called 'Op Camera' which enables all members of the public to enter the competition for the first time. 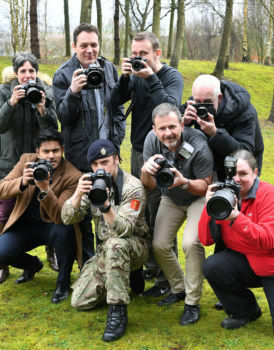 “We’ve got great photographers in the Army,” said Mr Craig, “but we realised that lots of other people have fabulous photos of what we do, including members of the public so this year we’re inviting everyone to enter". In all categories, judges will be looking for high quality photographs that can be used to promote the Army across traditional and social media channels. Running for more than 20 years, many of the entries have traditionally come from trained Army photographers from the Royal Logistic Corps. “The advantage our photographers have is that, as soldiers first, they deploy on operations with other soldiers to capture life on front lines and training areas around the world,” said Mr Craig. “We’re also asking the public to vote for their favourite picture,” said Mr Craig. “If you follow the Army channels on Facebook and Instagram you’ll be able take part”. Closing date for entries is Wednesday 27th September 2017. *Please make it clear that you are an adult volunteer/instructor when submitting your form.